Home > Blog > Home Additions > How Much Does a Home Addition Cost? Many people agree: home additions are a much more affordable and practical alternative to relocating, especially if you love your current location. Like any other type of renovation project, a home addition involves many expenses. While some of these are par for the course, others are often more flexible. Either way, it is important to have a realistic idea of your overall home addition cost to make sure it works with your budget. For starters, your home addition costs will likely break down into two categories, including materials and labor. For materials, the size and layout of the new space have a significant impact on the price tag. 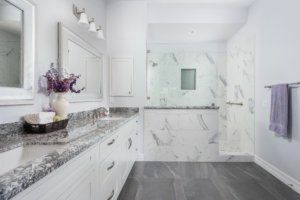 Before forging ahead, you will need to confirm the square footage of the area and have at least a rough idea about the design concept before we can calculate actual costs for the materials. For many homeowners, this can be a complicated process and can be tricky to figure out. You do not have to go through the often daunting process alone. We can help you plan your home addition design using high-tech tools and software to create 3D renderings and images to help you visualize what it will look like afterward. We can also provide an estimate for the cost of the project. Many factors impact the cost of home additions. The size of the addition is a primary factor. Additionally, the type of structure you have in mind, along with particular design details and features, will all have an impact on the price tag. At Republic West Remodeling, we are always happy to suggest ways to help keep the overall cost within your budget. Depending on the specifics of your home addition project, there may be additional costs to consider. Adding to the square footage may impact your property taxes and insurance costs. Also, if you live in a private/gated community, there may be issues, such as HOA fees, to consider. We always recommend checking with your municipality, homeowners’ association and insurance agent to find out what (if any) impact your home addition may have. Home additions are perfect for a growing family or for making the current space more functional and comfortable for everyone in your household. Contact Republic West Remodeling today to learn more about home addition costs and how we can help you create your dream home. We offer the best home addition contractors in the Phoenix and Scottsdale area. Contact us today to schedule your free consultation.